Guest blogger Louisa van Eeden-Smit of LexisNexis UK follows her recent article on smart contracts with another future-gazing blog, this time looking at what you need to future proof your career for the law firm of the future. What will the law firm of the future look like? It’s a reasonable question to ask considering how much the legal market has changed already, and the ever-increasing pace of change moving forwards. PwC’s 2018 Law Firm Survey found that 100% of the top 10 firms cited technology as the key challenge to growth over the next two years, but there is an overall optimism about the direction the industry is heading and the ability to stay competitive. The key questions that seem to come up in our experience are: How much will technology change the face of legal service? Will the generalist die out? Will more firms merge, or will the niche outfit emerge triumphant? Will more lawyers become self-employed, providing virtual services to organisations? Regardless of the outcomes, there are ways that legal professionals – be they part-time, returners, flexi-workers, or full-time in-house – can future-proof their careers. A degree of agility and flexibility will be necessary regarding how lawyers deliver legal services. This is as true now, with the advent of new regulations and an increasingly tech-savvy and informed client base, as it will be in the future. A willingness to adapt will serve you well, as well as open-mindedness regarding alternatives to the traditional model of working that is fast becoming a relic. From portfolio careers to flexible working, there are more models than ever to suit professionals – and benefit both employer and employee. Client loyalty isn’t a given in a market replete with so many options – it’s earned. Today’s client is more informed and tech-savvy than ever. They are willing to shop around and they are empowered. When clients demand efficient, tech-led services, for example, legal services providers should listen and adapt. It’s also important to be proactive and show how the firm is anticipating future change and preparing to evolve services. Client loyalty may not reign supreme anymore, so it has become critical that law firms prove themselves to the in-house legal teams they serve. Listening to what they need and learning the business from the inside out will allow them to stand out from the crowd by offering in-house counsel exactly what they want, exactly what they consider to be valuable. “Deep knowledge of the business is what really breeds loyalty,” according to Richard Harris, Chief Legal Officer at Robert Walters Group. In addition to learning about the business in order to provide more nimble and forward-looking advice, a future-proof and commercial legal professional is one that acts proactively. If you can look ahead and anticipate what issues might impact your business and put forward relevant plans of action, you will prove yourself to be indispensable. Such advice is “worth its weight in gold”, says Dean Nash, Head of Legal and Compliance at Monzo Bank, and will allow you to retain business in a competitive market. In-house legal teams consider it to be a win-win. After all, with technology streamlining the service, the process becomes faster, and invoices get lower. Legal tools are just that – tools that can be used to support lawyers, not replace them. Harnessing them to provide efficient service is a no-brainer, especially considering the fact that it can free up lawyers to focus on the parts of their job they actually like. Overall, legal professionals who are willing and able to jump in and run with the changes – namely, maintaining a lean, agile practice, one that uses technology and offers efficient, business-centric service – will find themselves in a good position – and way ahead of the curve. It also seems there is a common prediction emerging – part hope, part anticipation based on current trends – that law firms will be more holistic in the future. This applies to both client service and employee care. There is a hope that law firms will take a broader look at the service they provide; addressing the whole commercial picture of the business, as opposed to offering discrete pieces of legal advice, for example. For consultants or legal professionals moving into this sphere, or laterally moving within it, there are more opportunities than ever to have the kind of career you want. The legal market is constantly evolving and allowing for more diverse working opportunities – the only question remains: what does the legal team or law firm of your future look like? We are delighted to have Louisa Van Eeden of Lexis Nexis UK join us as a guest blogger on The Attic. Her first post takes a look at how millennials are shaping the future of the legal industry. Millennials. They’re the generation that everybody loves to blame for, well, pretty much anything. They are branded as “snowflakes”, and written off as a problem that either needs to be overcome, or ignored until they ‘grow up’ and become more like the older generations. But who are they really, and what impact are they having on the legal industry? Much like Generation X back in the 1990s, the term millennial is often used in the media to refer to anything related to a youth culture that other generations generally don’t understand that well. Unlike Generation X, the Millennial Generation was typically born between the early 1980s and the late 1990s, and grew up in a dramatically different landscape to their forebears. The world has changed: the internet dominates our lives, job security and home ownership are not a certainty; the future of the planet is at risk through climate change; and it’s becoming rapidly apparent that continuing with a business as usual attitude, just because that’s the way it’s always been, is untenable. Consequently, millennials simply aren’t as compelled by traditional practices as previous generations, both in life and work. They are who they are. Where previous high achievers would chase salary, millennials now typically look for a company that aligns with their values. For the millennial, culture reigns supreme. In fact, a study recently conducted by Fidelity showed that millennials are willing to give up (up to) £7,600 in salary every year for a job that gave them a better environment and culture. Considering that millennials now form the backbone of staff and client bases, making up to 35% of our current workforce, with that set to increase to 50% of the workforce by 2020, this is not a demographic to underestimate. Millennials are not just a vague notion of youth culture, they are real people progressing into management positions, and are shaping the technological and cultural landscape of every industry, including the law. This is a key battleground for law firms and one which millennials are well-positioned to approach and understand, especially because, as the Financial Times continues to report, firms are struggling to source and retain talent in today’s rapidly changing marketplace. Attracting the best and brightest young talent is more important than ever before, and harder than ever before, with this generation taking a markedly different approach to their careers. Millennials are key to helping law firms communicate their vision of the future, enabling firms to modernise with an eye to the demands of new talent and driving a competitive edge. Law firms are already changing with the millennial worker in mind. As the Law Journal Newsletter reports: “A number of firms have moved, remodelled or completely overhauled their physical workplaces with millennials in mind, favouring common areas, for example, over large corner offices.” But it’s not just physical changes, but more fundamental ones as well. As one of the co-founders of the Legal A-Team asserts, the partnership model – one of the traditional prestige markers in law firms – is no longer the aim: “Millennials want what they want and they want it now. The patience factor is not one of their fortes — they’re not going to stand around for 12 years.” In order to retain and attract millennial talent (and not lose them to agile, tech-forward start-ups), law firms will need to significantly adapt their culture and perhaps even their company structure. Law firms and lawyers need to think more creatively about their working practices in light of the rise of consumerism in today’s legal market. Client power is increasingly dominant, with billing and efficiency becoming ever more important. New and agile practices, from social media to technology, are areas where millennials excel. They also prefer to work collaboratively rather than as a silo, which may well serve firms well moving forwards. Being open to change and engaging in a dialogue with junior members of the team may be beneficial here, in order to ensure that the firm remains stimulated and doesn’t fall behind. While all three areas are important to understand, technology is the one that underpins them all. The agile working practices and lateral knowledge-sharing solutions favoured by millennial legal professionals and legal start-ups are all enabled by technology. Indeed, there are already reports that legal tools are being used with increasing regularity. A recent LexisNexis In-house Insights report, ‘Legal Technology – Looking Past the Hype’ found that 85% of in-house legal teams surveyed have introduced multiple technology types and almost three quarters (73%) of respondents who have already introduced legal technology tools are making plans to expand their implementation. It is very likely that the next generation of lawyers will practise law in very different ways. Technology is undoubtedly changing the legal profession, and it’s likely that the next generation of lawyers will practise law in very different ways. Indeed, there is already a growing section of the workplace – populated by those who have different life demands and values – who no longer fit the traditional working model. This has led to an increase in portfolio careers as well as flexible working models designed to benefit both employee and employer. This can be seen in the continued success of organisations such as Obelisk Support, which recently joined the FT Future 100 UK list as a diversity leader – the only legal company to do so. This trend is likely to continue to increase and evolve as more millennials dominate the workforce, bringing with them their approach to work-life balance, their use of technology as a natural enabler, the importance they place on purposeful business (one which looks beyond the profit line), their desire for flexibility, and their alternative definitions of success. We are entering an exciting era for the legal industry, one in which we wait in watchful anticipation to see who will accept and accelerate this new approach to working culture, and what impact it will have across the legal profession and wider society. For more insights on how young lawyers are best positioning themselves to weather the upcoming changes, check out our post on “The Legal Profession for Millennials”. How do we deal with upheaval as individuals? We have to adapt, be open to the changes ahead and listen to advice. In the legal profession, it is no different – as the world in which we practice law changes rapidly, lawyers need to be ready to rethink how they work. That is the premise of a new book by Michele DeStefano, law professor and founder of LawWithoutWalls and MoveLaw. 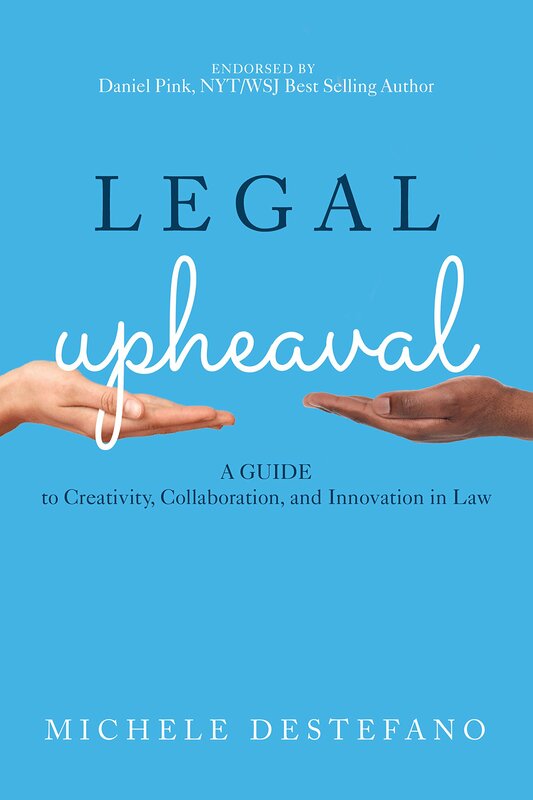 Legal Upheaval: A Guide To Creativity, Collaboration and Innovation in Law introduces readers to 7 essential experiences that lawyers must master to achieve innovation, transform their collaboration with clients, and create solutions at the intersection of law, technology and business. You are recognised as a ‘legal rebel’ by the American Bar Association – what does that mean to you? To me a legal rebel means someone who isn’t just talking about what needs to be fixed in legal practice, both in training and practice, but is actively taking risks to do things that are different. Ironically, since the law is slower to change than other industries it’s not that hard to be considered a rebel! There certainly is a lot of talk about innovation at the moment – in the book you define it as ‘lasting incremental change that adds value’, how much of that are we seeing right now? There are various ways to define innovation, and it can be a hackneyed word. But there is some consensus in law that innovation is still about small steps – small change is difficult but is easier than asking for ‘big bang’ innovation, especially in a world of people that like the status quo. However, lawyers and Heads of Innovation I think still inaccurately focus on the technology side of innovating, and it’s starting to frustrate in house teams and clients. Not every innovative solution has to be a technology. Will tech be involved in improvement? Yes probably, but we need to first change the view of the way legal services are provided. The focus needs to shift from what lawyers do, to how we do it; how we are utilising and leverage tech in order to improve our service and provide better legal products. If we look at design thinking, there was a similar trajectory that law is now learning from: there is lots of literature on the design thinker perspective on improving service, and we’re starting to see people from a design thinking method background being hired to work with lawyers to help them work through pain points and affect change in their service. Yes, that is something we typically struggle with. It’s a chicken-egg scenario: is the law attracting a certain type of person – those who are more introverted, more risk averse, more sceptical, but are great at complex problem solving – or is it that through the way training and practice churns and burns us that we create them? That’s not to say being risk averse and sceptical are bad things, because in so many ways it’s our job to be those things to protect clients. We need those qualities, but it’s important to not be that all the time in the way we approach everything we do. Be a human! Use that fantastic lawyer mind but let’s work together and build on each other’s ideas to create a better service for those we work with. Tell us about how you try to encourage openness with Law Without Walls? With Law Without Walls, we have created a learning programme that is multidisciplinary in every way – people of all ages experience levels and type of discipline: academics, public servants, law firms and law schools from across the world come together into teams to co-create a Project of Worth – a practical solution to a real business problem designed to bring value. It’s extremely rewarding to watch the teams, especially the lawyers, change and grow in the way they ask questions, think about problems, approach meetings etc. Especially when you hear that their teams back home notice the difference too, so much so they are asking them ‘who are you and what have you done with Craig? !’ That impact is exactly what we aim to achieve. How was the process of writing Legal Upheaval? What did you learn from it and was there anything that surprised you in the conversations you had? It wasn’t so hard to write but it was hard to edit! It took two years of interviews and I had enough for three books but had to edit it all down to one. Interviewing is really a tough field – it requires listening beyond listening, there is no ‘I’ or ‘me’! We should be doing more interviewing training in law school. Obviously I knew going in that the topic of innovation was being pushed, GC and in-house counsels are constantly saying ‘innovate or die’ but they don’t exactly know what it is or what they are asking for. Can you really measure it if you only know it when you see it? There’s an analogy to be made there with the diversity movement – calls for diversity initially were very vague, so firms would say ‘oh we have a female working with us’ – no mention of what level they were at, but okay! It was only over time that the questions became more focused: what % of minorities are in our organisation, what % on my senior team are diverse etc. Now, clients are asking for your flexi-time policies, because without that you cannot support diversity – diversity doesn’t truly exist without creating an inclusive culture and environment. It’s the same with innovation – who is going to lead it? What are you hoping to achieve? If you don’t want the same thing to happen as diversity, where you are racing to meet client demand instead of forward thinking and define innovation for yourself, now is the time to be asking serious questions. Part of being a great innovator is self awareness. Another thing I was surprised by was the amount of in-house counsel complaints on simple matters – particularly over advising. There is a disconnect there, and I don’t know why or what is happening. Perhaps it’s because we are taught to see the trees not the forest, so many lawyers are missing the bigger picture of how their documents are used in day to day business practices. In-house counsel can read the law, they don’t want to receive reams of information that they have to filter and rewrite. We need to spend more time sitting back listening and asking ‘why’ in what we are doing. Of course, that makes people uncomfortable, especially the more senior we get, as we think we know the answers and we are taught to find answers for ourselves. From your experience as a professor of law, is there a change in approach to teaching? Are students coming in with different expectations now? It is a bit like moving the Titanic. I don’t know if students are all that different – for hundreds of years they have come in with bright eyes and big hearted missions, that won’t change, but the next generation may have different expectations of the culture of law. Unfortunately law schools are much slower to move and the tenure systems that are in place very much encourage status quo and professors keep on teaching the same things they have taught for years. So, though there are some great things being done in law schools across the world in terms of bespoke programmes being created, it’s not reaching every student that it should. But it’s not just up to the schools, it’s going to take the whole village to move and change way we train and retrain lawyers. What do you hope people will take from the book overall? My hope is that people will leave with hope. Lots of articles about law as an industry are negative, but we should realise that some of the traditional habits that have made us successful so far are also characteristics that we can utilise to get over hurdles. The mission of the book is to get every lawyer to try a problem solving group project with the mindset of an innovator and try to adopt some of those skill sets and characteristics. My three rules of engagement are Open Heart, Open Mind and Open Door – it does sound corny, but they are essential. Yes, effective people are good at editing out the nonsense and saying no to things, but innovators are different. They let go of preconceptions and allow themselves to be more open to accept seemingly silly ideas. That’s something that those in the legal industry can adopt and build on, and take that brilliant lawyer brain to fine tune and turn them into the really good ideas. We can approach creative problem solving collaboratively through just a small shift in thinking. Michele’s efforts to encourage collaboration struck a real chord with us here at Obelisk. While this change in mindset is a challenge for all lawyers given their traditional education, DeStefano concludes it is overall good news for women lawyers, because on balance they are better at the necessary skills: having an Open Mind, Open Heart and Open Door. It certainly gave us hope that we are on a real cusp of change in the legal industry, and that small actions being taken today are laying the groundwork for a more open and inclusive future. While cryptocurrency valuations may currently be in a state of decline, confidence around them being a long term prospect seems to be increasing, and more people in the legal industry are taking note. At Obelisk Support, we follow this topic with interest as our clients get on the cryptocurrency bandwagon. Investment fund lawyer John Lore advises clients on cryptocurrencies and investments as part of his firm Capital Fund Law Group, and places great importance on educating the wider industry on the implications of cryptocurrency investment and blockchain technology. He took some time out of his increasingly busy schedule to talk to us about the pressing issues and how lawyers are responding. What is your legal background and when did you decide to create the Capital Fund Law Group? I was previously with Akin Gump Strauss Hauer & Feld LLP, where I worked within their Hedge Fund and Private Equity practice. Then in 2010, I launched my own firm to focus exclusively on the investment fund sector and fund manager sector. To begin with, most of our clients were in the United States and it took a few years to build a global clientele. How did you first come to deal with cryptocurrencies? What were the perceptions and predictions for cryptocurrencies like then, and how have they evolved since? We started getting some phone calls about cryptocurrencies around 2013. We initially held off were as we were not ready to jump into the asset class, until 2016 when we launched our first cryptocurrency fund. [In those years] we invested effort in getting up to speed on regulations and drafting some of the initial disclaimer language. It was still very new so getting comfortable from a regulatory perspective took some time. In terms of wider perceptions – honestly, I didn’t see much perception at all from legal community early on, pretty much nothing was being discussed back then. The shift in perceptions really happened recently in Spring 2017 where there was an explosion of activity in cryptocurrency due to the initial major surge in price of Bitcoin. Though perceptions around cryptocurrency are rapidly developing, it’s still a very new area. How do you support and advise clients who are interested yet inexperienced? We emphasise a solid experience in finance. From 2017, we ended up receiving hundreds of phone calls for individuals who wanted to start cryptocurrency funds. We were, and still are, very cautious about representing fund managers who have experience with crypto but don’t have a background in the finance sector. We are more on the side of tempering the swift formation of a cryptocurrency fund and teaching emerging managers how to create the proper structure for a fund. There are a lot of people we deal with who are very savvy with technology and are startup focused, so we advise them to partner with career finance people to create a more diversified skillset. How have lawyers had to adjust their learning and experience to cryptocurrencies and the blockchain? There is much more interest now than there was, particularly in recognising that certain aspect of blockchain technology will change the future of a number of industries. From the investment side, we’ve seen a lot more education pop up – there have been some real strong early adopters on the legal side, who lack seasoned experience in finance, that we end up turning away but that gap is now getting filled by others. In general, there is a continued interest in the legal community in understanding the space and serving it. We, of course, only see a small slice of that in an investment context but in terms of the blockchain universe e.g. smart contracts, coin offering token offerings etc. there is a tremendous need for legal counsel in all those fields. I think we’re right in the middle of the shift between curiosity and significant resources being allocated to the area. Again, I can only speak for the investment side, but a lot will depend on emergence of institutional investment and Wall Street involvement. I anticipate along with the rest of the cryptocurrency community that there will be major transitioning to a greater focus from these areas. What impact are cryptocurrencies and the blockchain having now? There’s a plethora of opportunities that can be matched with technology across many sectors. On the investment side, there are major opportunities for cryptocurrencies as a stored value, and blockchain is already proving to be a very important aspect of the industry going forward. What is the future looking like? Will certain cryptocurrencies eventually become a way of life for more institutions and individuals? There’s the question of whether it will gain mainstream acceptance and whether it will continue as a convenient form of exchanging value. My predictions are: as an investment vehicle, yes, for next few years it will be limited to hedge funds and to high net worth individuals as a major trading instrument, but that can change as soon as there are infrastructures capability such as custodies and exchanges allowing for exchange traded funds (ETFs) – that would provide a strong avenue for retail level participation. Regarding seeing cryptocurrency as a replacement currency for our existing financial structures, that is more of an academic question at this point. What developments and changes are still required to ensure longevity? That’s exactly the question I like to be asked! Right now, the question most people have in mind is when and how the problem of custody will be resolved. That is both a technological problem and a legal problem. Getting the technology to a place where we can satisfy the custody requirement to meet financial crime compliance and to satisfy the regulatory requirement of jurisdictions around the world is a big challenge. So, we announced in July at our Cryptocurrency Custody workshop the creation of a working group, an international council of self-regulatory organisations that is going to be co-sponsored by the Stanford Law Blockchain Law and Policy Journal, and the Global Center for Investment Fund Studies, our non-profit research centre. There is a real need for international dialogue. There has been a tremendous interest in London, Dubai, and parts of Asia, and everyone is looking to the U.S. on this – a lot of dialogue is needed on how regulations will be shaped how self-regulatory bodies will play a part in that. John Lore is a member of the New York State Bar and the Utah State Bar. Mr. Lore represents fund managers and securities issuers throughout the United States. Capital Fund Law Group advises emerging and established hedge fund managers, with a strong focus on cryptocurrency funds on all aspects of fund formation and ongoing operations.